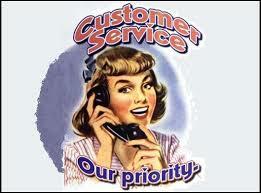 Customer service is such a large part of any business and a very important part for that matter. Customers keep us in business; without them we have nobody to sell our products or services to. And, of course, the customer is always right. Right? Well not so fast. I have dealt with a lot of customers over the years and let me say they have not always been right. As a matter of fact, sometimes they have been flat out wrong. That’s right. Wrong! Ask anybody in business and I am sure they will agree. That being said, I would never tell the customer that. It’s all in how you approach and interact with the customer. In that sense, yes, the customer is always right and should be treated as such. Yes, there are those cases where the customer is flat out wrong but I never let them know that and just do what I need to do to resolve their issue and make sure they are satisfied. Often times the customer is simply acting on the information they have and it is my responsibility to make sure they have all the correct information. It can be as simple as a customer misunderstanding one line of text on our website; it might make perfect sense to me because I deal with these products every day and understand them inside and out, but to a new customer that one line might be interpreted completely opposite from what was intended. To make matters more difficult, Go-Go Babyz makes baby gear & toddler gear for traveling. All of our products are designed to help busy parents who are on the go with their kids and all their gear whether heading around the corner to the grocery store or traveling across the world. Both kids and traveling can be stressful individually, put them together and things can get messy. With that combination I know we are going to have some interesting customer service calls. As a matter of fact, over the years we a have had quite few that came in from the airport. Want to talk about an upset and stressed out customer, put them in an airport with a car seat stroller that’s not working properly. Ugh! I completely understand because I have been in the same situation. What it boils down to is customers want to be heard, validated and treated with respect. They have a problem and they want it fixed, that’s all. Remember the Golden Rule you were taught as kid? That’s what it’s all about; treat others as you want to be treated. I may be a business owner at Go-Go Babyz, but I am just another customer to all the other businesses out there and when I have an issue I want it handled properly and don’t want to be treated like an idiot. Trust me, I have been many times. It always amazes me how some businesses even exist with the level of customer service they provide. Go-Go Babyz is a small family business and we are no different than our customers; busy parents on the go. We always keep that in mind when dealing with our customers and take great pride in our customer service. When we looked for products for our kids, whether it was a diaper bag, baby carrier, baby stroller, car seat or crib we wanted to know all we could about it and make sure it was safe, functional and met my needs before making a purchase. We also wanted great customer service after the sale if there was an issue or we just needed help with the product. Now I understand that no matter what we do we just can’t make everybody happy but I am proud to say that customer service is one our strongest assets and we strive to always get better and make sure our customers are happy . So, in the end the customer is always right.